CSS Virginia was built at Boston Navy Yard as the frigate Merrimack, and commissioned 20 February 1856, Capt. G. J. Pendergrast, USN, in command. Departing Boston she cruised in West Indies and European waters in 1856-57. Following brief repairs she sailed in October 1857 as flagship of the Pacific Squadron, cruising the Pacific coasts of South and Central America until November 1859. Returning east, she decommissioned at Norfolk 16 February 1860. On 20 April 1861, in the confusion following the outbreak of the Civil War, retiring Union forces burned Merrimack to the water line and sank her to preclude capture by the Virginia militia. 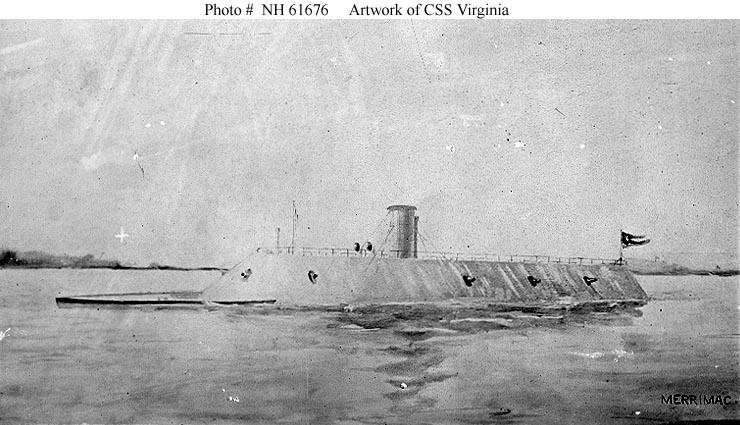 The Confederates, in desperate need of ships to challenge the Union Navy's superiority at sea, raised Merrimack and rebuilt the hulk as an ironclad ram, according to a design prepared by naval constructor Lt. J. M. Brooke, CSN. Commissioned as CSS Virginia on 17 February 1862, the ironclad was one of a series of efforts--including blockade runners and submersibles--intended to whittle away at the effectiveness of the Union Navy's blockade of the Confederacy. Virginia then turned her attention to Congress, which grounded while attempting to close. Opening fire from a distance, and assisted by the lighter ships of the James River Squadron, Virginia forced Congress to haul down her colors. As CSS Beaufort and Raleigh approached Congress to receive the surrender of her crew, Federal troops ashore, not understanding the situation, opened a withering fire and wounded Buchanan, who retaliated by ordering hot shot and incendiary shell fired into Congress. The latter, ablaze and unable to bring a single gun to bear, hauled down her flag for the last time. She burned far into the night and exploded about midnight. Virginia did not emerge unscathed. Her riddled stack limited her speed--and she was already slow to begin with--two of her large guns were out of order, several armor plates were loose, and her ram had been lost in Cumberland. Nevertheless, the ironclad went on to attack Minnesota (Report of the Steam Frigate USS Minnesota), but because of depth of water could not close the range to do that steam frigate serious damage. Virginia then turned back and anchored that night at Sewell's Point for repairs. Flag Officer Buchanan was taken ashore to the hospital and Lt. C. ap R. Jones, CSN, who had conned the ironclad after Buchanan had been wounded, assumed command. On the following morning Virginia returned to battle. During the previous night, however, the Union ironclad Monitor had arrived in Hampton Roads after a hazardous trip from New York. The two warships fought a long, inconclusive battle on 9 March--the first ever fought between powered ironclads--and Virginia was forced to retire from the area. On 25 March, Flag Officer J. Tattnall, CSN, took command of Virginia and, with the ironclad as his flagship, sought to deny the James River to Union forces. Although the ironclad helped checkmate Union forces for the next several weeks, the Confederates eventually failed to prevent Federal landings at Yorktown or Union operations on the Peninsula. Forced to evacuate Norfolk, the Confederates tried to take Virginia up the James River but her draft was too deep. The crew ran her ashore near Craney Island, fired and destroyed her on 11 May 1862. Whittle and company kept up their daring sea raids until August of 1865, when they learned that the war had ended five months earlier. The ship returned to England, having flown the last Confederate flag at sea in defiance of the U.S. Baldwin and Powers recount their tale in a lively, evocative style and may be forgiven for being overly fond of their hero. Whittle, they say, "was as good a man as history seems able to produce: a warrior of courage inconceivable to most people; a naval officer of surpassing calm and intelligence; a seeker after Christian redemption; a steadfast lover; a student of human nature; a gentle soul; a custodian of virtue." Born in 1809 into a slave-owning, tobacco-farming family in southern Maryland, Semmes was orphaned at an early age, grew up in Washington, D.C. and joined the U.S. Navy at 17, remaining a staunch Southern partisan who espoused racist views and strongly believed in slavery. After serving without any particular distinction for 35 years, he made his mark with the Confederate navy. This well-conceived and executed military biography will have extra appeal for those who are familiar with nautical terms.